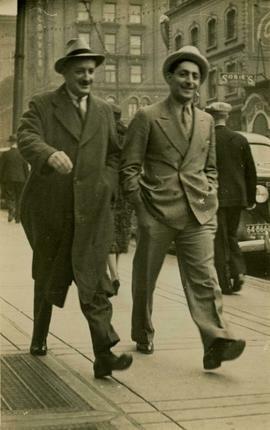 Photograph of Harry Seidelman and Dr. Margulius walking on the street in suits and hats. Photograph of Harry Seidelman (centre) and two unidentified men. Photograph of Harry Seidelman outside his home at 4623 West 7th Avenue, Vancouver, British Columbia in 1929. 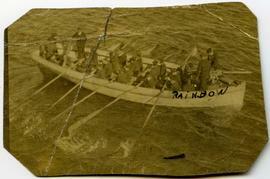 Photograph of Harry Seidelman on a boat named the SS Prince Rupert in 1919. Photograph of Harry Seidelman crouching on the lawn of his home at 4623 West 7th Avenue, Vancouver, British Columbia. Photograph of Harry Seidelman, who is wearing an Aboriginal headpiece, and an unidentified man. Photograph of Harry Seidelman with the two of the Mallek boys and an unidentified girl. Photograph of Harry (third from right) and Benjamin (second on the left) Seidelman with a group of unidentified people.